Stay on a Boat in Malta and holiday as the mood takes you. Malta is holidaying as the mood takes you. Stay on a boat in Malta for your next holiday and with near year-round sun, you can indulge in ‘outdoor living’ at its best. In Malta you’ll experience 7000 years of history yet live passionately in the present. An astonishing array of things to see and do all amidst the spectacular backdrop of the Islands stunning scenery makes this a unique place to stay. The history of Malta is a long and colourful one “dating back to the dawn of civilisation”. In 60 A.D. St. Paul was shipwrecked on the island while on his way to Rome and brought Christianity to Malta. Since that time the island has been ruled by The Arabs, The Normans and The Aragonese. Charles V then bequeathed Malta to the Knights of the Sovereign Military Order of St. John of Jerusalem until in 1798 Napoleon Bonaparte took over Malta from the Knights on his way to Egypt. The French presence on the islands was short lived, as the English, at the request of the Maltese to help them, defeated the French in 1800. British rule in Malta lasted until 1964 when Malta became independent. On your holiday in Malta you’ll explore those 7000 years of history yet live passionately in the present. Your stay will span the millennia with an astonishing array of things to discover. And wherever you go, the Island offers an exhilarating contrast of colours: the azure of the Mediterranean, the mellow honey-coloured limestone which characterises the architecture, and clear skies. The Islands are a feast for the senses. What makes a holiday in Malta unique is that so much of its past is visible today. Everywhere you go, a unique historic sight awaits. Temples, palaces, cathedrals, and forts provide a living history you can almost touch. Sound plays an important part in the life of the Islands. The mix of fireworks and village band marches transforms a summer night into a special memory. The advantage of staying on a boat in the Malta is that you can experience several holidays in one. Cuisine here is a taste of the Islands’ multicultural heritage. Local restaurants (often located near the marinas) offer a creative fusion of tempting fare. After dark the islands clubs, wine bars and casinos entice you with their own brand of excitement. For a tempo and scene change from Malta itself, hop to the sister islands of Gozo and Comino. Here, you’ll holiday within a holiday and at the most relaxed of Mediterranean paces. Malta’s climate is typical of the Mediterranean and is strongly influenced by the sea. The Maltese Islands have a pleasantly sunny climate with a daily average of around 12 hours sunshine in summer going down to 5 to 6 hours in mid-winter. For the ultimate in secluded romance, couples can escape with Beds on Board and stay on a boat. Malta’s location at the heart of the Mediterranean also makes it the ultimate yachting hub. 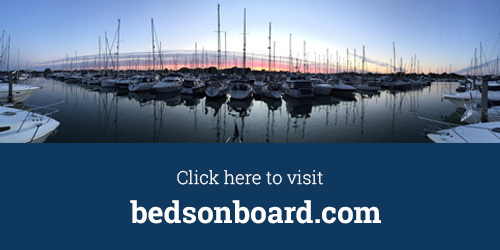 With a number of stunning marinas allowing guests looking for a place to stay to sleep on board smaller yachts and motorboats and even sleeping on a larger super yacht. Malta is holidaying as the mood takes you. Search to stay on a boat in Malta today, enjoy year round sun, experience outdoor living at its best and discover one of the Mediterranean’s unique places to stay.